Kekoa is originally from the Seacrest Wolf Preserve in Florida and came to Colorado with his sister Sakara. His name means Brave One in native American. He is best known for his thick silver-gray mane and his striking appearance. 'Kekoa is a handsome young male with a sweet personality, which is good because he loves to greet visitors with wolf kisses,' his biography on the center's site says. 'When he puts his paws on an other person's shoulders he towers at about 7 feet.' He also weighs 115lbs. Danielle shows no fear as she plays with Kekoa. 'I have always had a passion for nature and animals,' she explains on the site, 'These wolves have my heart and I am honoured to have been accepted into their pack'. Timber wolves are also known as grey wolves. In the lower 48 states of the US, they were hunted to near extinction, though some populations survived and others have since been reintroduced. Few grey wolves survive in Europe, but many live in Alaska, Canada, and Asia. They are sociable animals who normally roam in packs of six to ten. Good morning! Here is another video of Danielle with Kekoa. Sakara also makes a guest appearance. Have a great day! 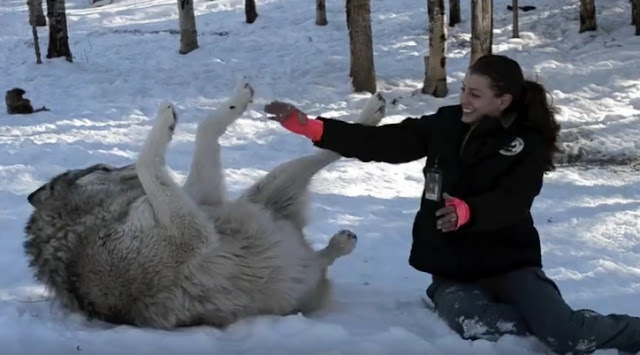 Responses to "The heartwarming moment the giant timber wolf plays with wildlife worker"
Two absolutely outstandingly beautiful wolves. I can't get over just how big Kekoa is. I would be blown away to be in the presence of these two gentle giants. I love this. 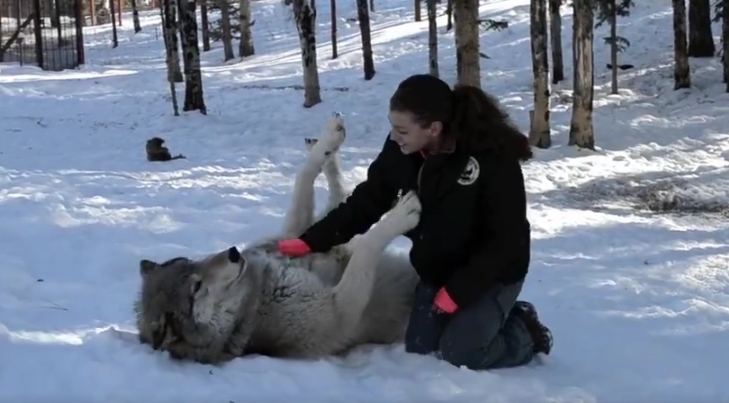 Having a huge size and seeming imposing, this wolf is so affectionate and sweet. Is he mixed with a giant malamute! Absolutely beautiful animals. Divine creatures made by God. Love them. We must do all we can to protect and save these beautiful animals. They are the soul of the earth and the spirit of the wild. The world would never be the same without them.